Loosestrife in the garden, where to position? In the photo: loosestrife in the garden. A representative of the family primulaceae leads his Russian name from the resemblance of the foliage of willow. Other name, "Bujanovac", the plant has received from the Polish "Bazant" (pheasant) because of the bright coloring of flowers. Vladimir Dal in his dictionary, calls loosestrife "through the grass" at the place of growth. 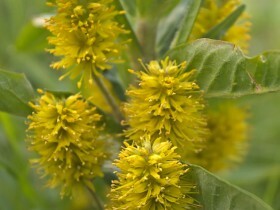 The Latin generic name "Lysimachia" given on behalf of the bodyguard and commander of Alexander the Great, of Lysimachus. After the end of hostilities he was the ruler of Thrace. Pliny says, that Lysimachus was the first to describe the plant. The genus is widely distributed in subtropical and temperate zones of the Northern hemisphere, most species are native to China. 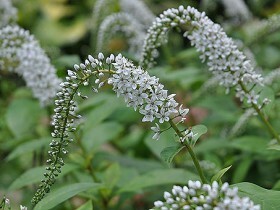 In primary school can meet loosestrife monetary, Asherah, Lily of the valley growing in the far East. In The Caucasus, in the European part of Russia, in Central Asia, in Eastern and Western Siberia, the common loosestrife common. Prostrate or erect herbaceous plants have leafy stems. The leaves are opposite or whorled, flowers pinkish, white or yellow, gathered in corymbose or racemose inflorescences, the flowers are arranged in bunches in the leaf axils or single. For most species of plants are preferable to shade or partial shade. The monetchatogo loosestrife grows well in the sun, but prefers partial shade, it can be planted under trees. Purple loosestrife requires a lot of light. Loosestrife point, monetary, on the rocks. The plant requires no special attention, but faster growing in the fertile, loose and wet soils. 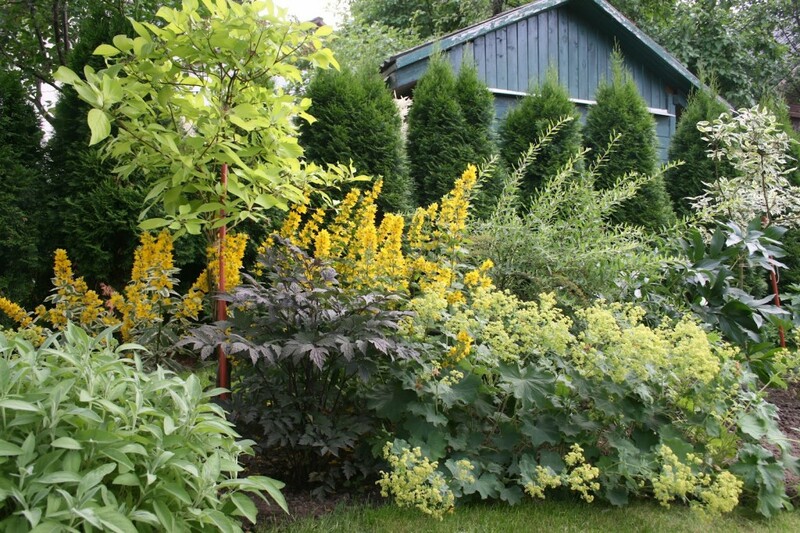 After two or three years after planting you can expect the formation of dense clumps. Orbanici landusky, speckled and ciliated grow best in moderately damp area, monetary able to grow in shallow water up to 10 cm deep. Loosestrife common can be planted at the same depth, racemose and it is better to keep the depth of 30 cm. Plants do not require winter shelter. During the summer season it is necessary to maintain high humidity. The faded part of the stems cut vertically growing individuals. With the onset of autumn, the stems are cut down, the plants spiked compost. In one place the culture is able to grow to 10 years. The growth monetchatogo loosestrife is easily controlled, ciliated, speckled and catecory able to quickly spread, dangerous to release them for limited container limits. Loosestrife reproduces vegetatively and by seed. For hardening and better germination it is advisable poslevoennoe freezing in a month or two. Flowering the plant will begin in the second or third year after planting. 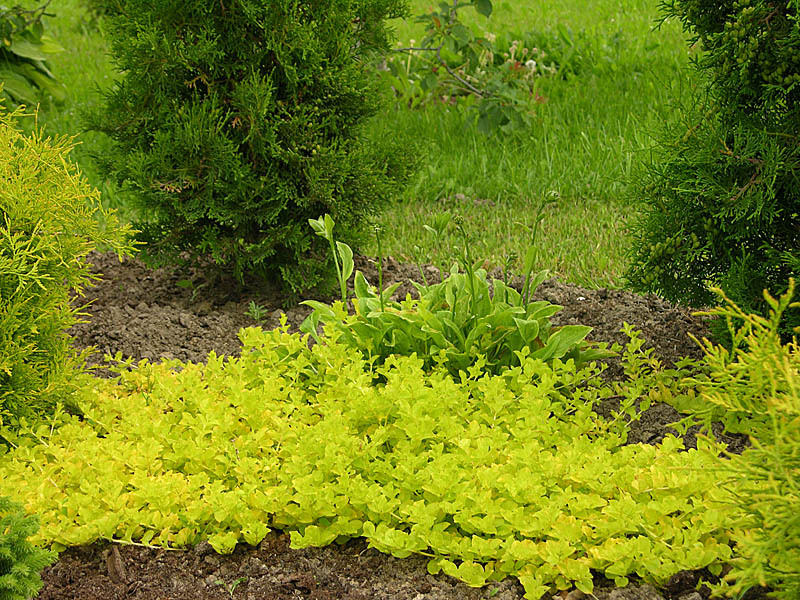 Transplanting and division is performed in early spring before the appearance of the foliage or in September. The plant is vegetatively propagated from rhizome segments, division, root cuttings and suckers. Have monetchatogo loosestrife grow well individual shoots up to 20 cm or seated lateral. Mostly the plant is used for group plantings. 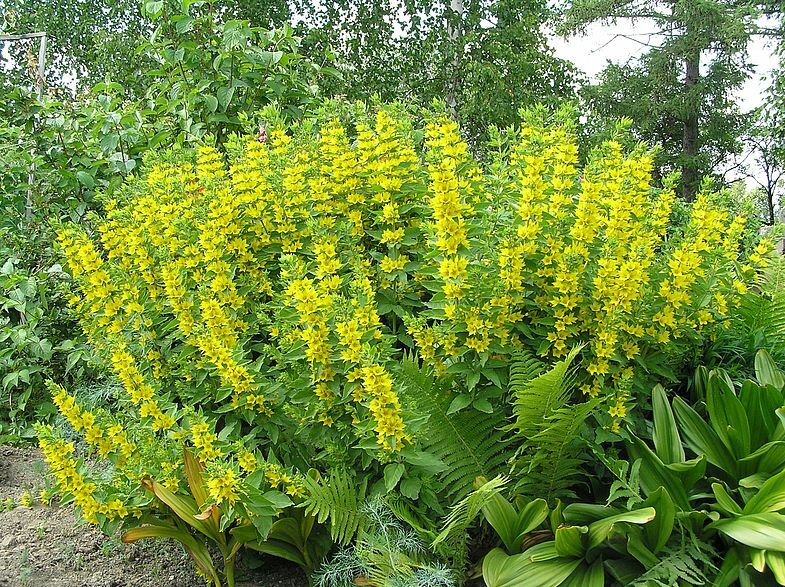 Loosestrife monetary – efficient groundcover in the shade, partial shade, the sun, he successfully replaced the lawn. They can be close rocks and walls, decorate the largest Alpine slides. The variety "Aurea" – basket, decorative grass looks good in containers. Issue shore you can use loosestrife common, point, cleroidea. High grade used in the flower beds, located in the shadow of, and on the banks of, decorated in a natural style. 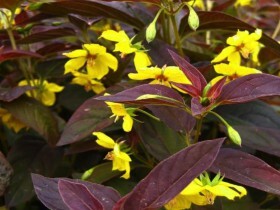 In the photo: loosestrife monetary varieties “Aurea” on the retaining wall. 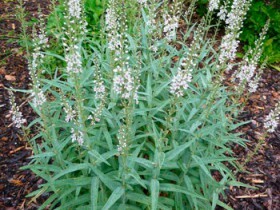 Loosestrife goes well in group plantings with bells and astilbe, ferns and goat, other shade-tolerant perennials. 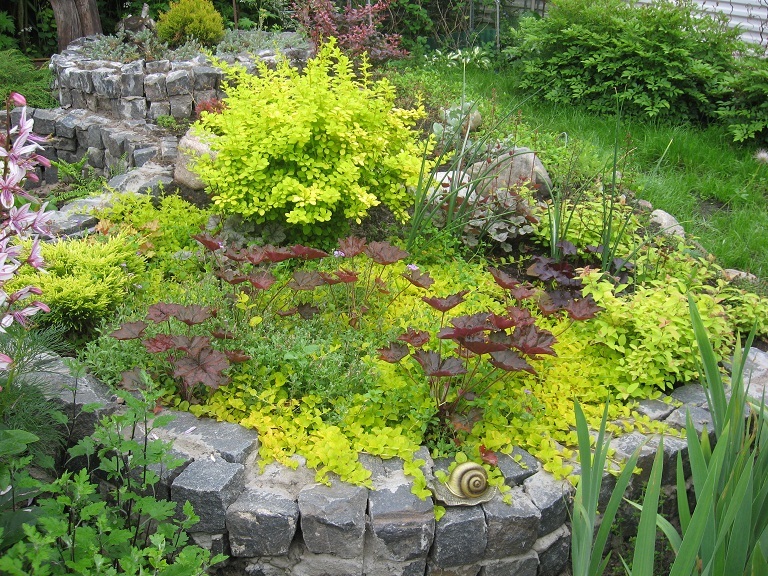 Purpurnolistnaya and variegated types contrast with the original hosts, the saxifrage, rodgersia, near the clumps of cereal, Sitnikov and sedges. The place of wild growth – Europe, ponds, shady woods, foothills, subalpine zone. The stem is unbranched, raised above the ground on 10 – 30 cm. 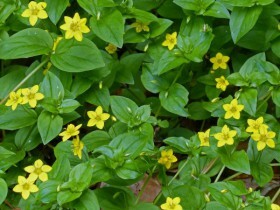 The foliage is large enough, flowers – single, yellow, flowering time: may-July. Found in shallow waters on the birches in rivers and lakes throughout Central. The strong rhizome produces, straight stems, foliage – narrow. Flowers – yellow, small, located in the leaf axils. Flowering time: may-June. Point loosestrife in group planting. Motherland – the South of Primorye, meadow slopes and mountain forests. The root is pinkish, similar to the rhizome of Lily of the valley. The stem is straight, leafy, high, reaches 120 cm. Flowers – white, collected in the ear, flowering time: the end of July. Prefers partial shade, dank. Used for cutting and in group plantings. The most popular variety – "Lady Jane", height – about a meter, flowering time – summer's end. It is widely distributed: Ciscaucasia, Russia, The Mediterranean, Western Europe, Japan, The Balkans, North America. Favorite habitat – meadows, shady grove, shores of reservoirs, margin of swamps. Stem – lying, the leaves are oval, yellow. If the site, planted plant, well-lit, flowering time will be in June, for shading areas of meadow tea blooms later. In the wild you can meet monetchatogo loosestrife blooming in may, in August. The species is able to cover not only horizontal surface, but enough steep slopes. Meadow tea is well propagated through vegetation: office of rooted shoots. The time for planting the whole season. Unpretentious plant grows in sun and partial shade, in moist soils, can tolerate drought, flooding, trampling and mowing. 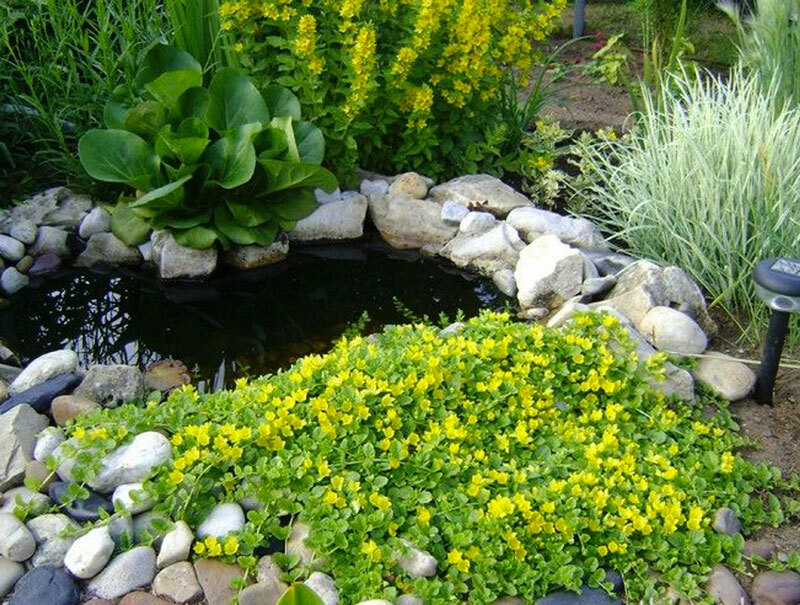 In garden design is used for decoration of low plants on the soil surface, to create green carpet stains, for decoration artificial reservoirs. The monetchatogo loosestrife in the garden. A perennial plant native to North America, stems – erect, up to half a meter in height. Foliage is wine – red, flowers – lemon yellow, inflorescence – loose. Flowering time: August-September. Culture loves the sun, looks good on a background of stones, use to create contrasting flower beds. Homeland plants – Greece. 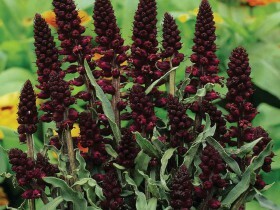 Height – meter, unusual appearance with ears almost black flowers, contrasting with silvery green foliage. At the edge of the sheet – easy shirring, flowering time: July-August. A native of South-Western Europe. Quickly growing outwards, height – meter. The inflorescence is a spike, flowering time – summer's end. View hardy, known in culture since the nineteenth century. Loosestrife is not exotic, not the usual plant and not new. A rare guest in our gardens, it is only because, that does not have the brightness, drawing the eye immediately and from afar. The plant is original, each view is like another. Lily of the valley loosestrife or cleavely. All content on this site SamDizajner.ru written specifically for Simdesigner, copying 1 in 1 strictly prohibited. Reprint, full or partial rewriting of the article “Loosestrife – use, species and varieties”, possible, only when you specify the full, active link to the source.